With Our Writer Powers Combined! I went to my first actual book launch on Saturday. 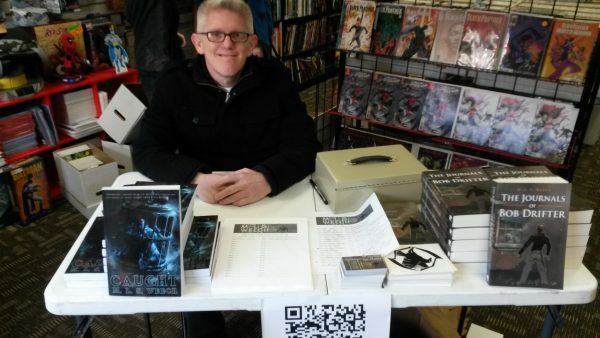 Fellow blogger and now real-life pal MLS Weech released his second book, Caught, on Saturday at a comic book shop about 20 minutes from my house. I was excited to find out that an author whose blog I’ve been following for some months was actually located in the Baltimore area, so I drove out to his book launch to meet him and support him. I now own an autographed copy of Caught, which has immediately jumped to the next spot on my reading list. We talked a good bit about our projects, our strategies, and our upcoming plans. I even got to meet some of his family and friends who also turned out to support him. I think it’s all too easy to feel isolated in your own little corner of the internet when you spend most of your time interacting with other writers via blogging or social media. At least, that’s how it often feels to me. Meeting MLS Weech in person was a strong reminder to me (and, I hope, to him as well) that we can reach other as writers far beyond liking and commenting on each other’s posts. With just a little bit of effort, we can grow a local network of like-minded writers who just want to share our work with as many readers as possible. We talked quite a bit about supporting each other even more as he promotes his second novel and I prepare to publish my first at the end of this year. So, if you know any of any local writers releasing or signing books in your area, stop in and say hi to them. You just may make a friend and a fan. That alone is worth the trip, isn’t it? I can say it was a real pleasure meeting you and getting to know you in person. It was just so cool sitting and talking shop. That day and my conversation with you was what I would define as a “real author” moment. At DINFOS, I’m always talking about photos or teaching. I’m a professional in my element talking about my craft. With you there, I felt the same. I was thrilled to meet you. Any time you want to share a hot beverage or chat, just let me know. P.S. Sorry I’ve been behind in the blog world lately. Things have only just slowed down. Yeah…let’s start planning those times of things.